A commercial airing on 580 WIBW for Dave Webb at Webb & Associates of Stilwell has been honored as one of the best in the 2017 National Auctioneers Association (NAA) Marketing Competition. Recorded by Keith Montgomery, director of content at Alpha Media USA Topeka, the commercial featuring Webb’s professional auctioneering services was second in the radio advertisement category. Presented in partnership with USA TODAY, the competition featured more than 850 entries from throughout the country. Awards were presented at a NAA meeting in Overland Park. Webb & Associates’ commercial aired in conjunction with Webb’s sponsorship, involvement and attendance at the Farm Profit Seminar hosted by the 580 WIBW Farm Department at Paola on March 22. Advertising all of his auctions on 580 WIBW, Dave Webb of Webb & Associates specializes in the sale of real estate using the auction method of marketing. With an unparalleled knowledge of land, focused planning and preparation, aggressive marketing, and an experienced team of auction professionals, Webb & Associates has established a proven process and produced significant results for hundreds of satisfied clients throughout the Midwest since the mid 1960’s. 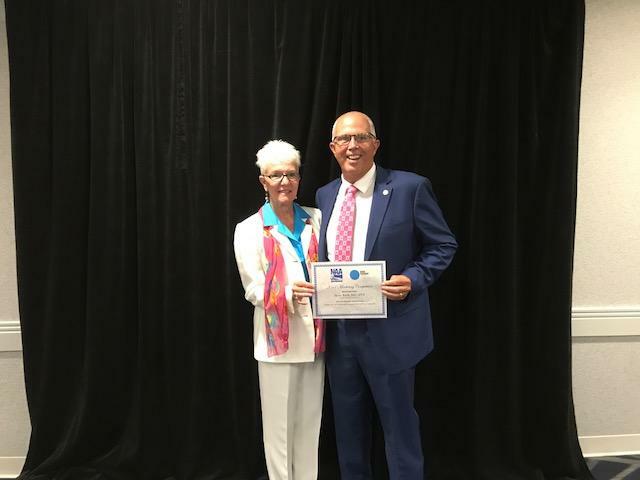 At the National Auctioneers Association meeting in Overland Park_ Wendy and Dave Webb of Stilwell accepted a marketing competition award for the Webb & Associates commercial that aired on 580 WIBW. “We are family owned and operated with an unparalleled data base and property expertise. We are not a franchise company,” Webb pointed out. “Each property is unique and we take pride in taking part with owners in the sale of their property through proper marketing, due diligence, preparation, display, and auction either live or on line for competitive bidding until the highest price is obtained,” Webb said. In addition to the auctioneer, there are other key personnel who help develop a successful auction, Webb stated.They include individuals who set up the actual auction, bid spotters during an auction, cashiers, clerks, and assistants who take pride in their service to the company. “Regardless if your auction is live or on line, daily operations are performed in a centrally located office at Stilwell,” Webb continued. “For the client’s convenience Webb & Associates also offers a state of the art mobile office and software. This allows auctions to be performed at various locations around the country. “We are not concerned about the quantity of auctions, but the quality of auctions,” Webb insisted. “Auctions are also social events where people attend to visit with old friends, find great deals, listen to the auction chant, make sound investments, and many walk away with new friends,” the auctioneer said. Living his life believing that service to his community is a high priority, Webb has served at all levels from the city and county across the state and at the national level. Webb served in the Kansas House of Representatives in the late 1970s and early ’80’s then in the Kansas Senate in the early ’90’s. His grandfather also served in both the Missouri House of Representatives and the Missouri Senate. In addition to the auction and appraisal business, Dave and his wife Wendy have enjoyed many other endeavors. Wendy worked as the director of the Parents as Teachers program in the Blue Valley School District for 27 years. Recently retired, she was recognized the Kansas legislature for her vision and commitment to Kansas children and families and continues to work with this program. Dave and Wendy keep an active schedule with their farming business; raising grain crops, hay, and managing agricultural land. They also enjoy raising honeybees and most of all they enjoy spending time out on the farm with family and friends. With a passion for developing new leaders and promoting the auction method of marketing, Webb has served and been recognized for many diverse leaderships roles. Among the groups served are the Kansas and National Auctioneers Associations, Johnson County Airport Commission, Johnson County Soil Conservation Board, Blue Valley Rotary, Pioneer Bluffs and Ranch Land Trust of Kansas, and his bank. When you consider selling your farm or property, it is a once in a lifetime decision. You need to consider what you look for in an auctioneer. One who is a professional in their business, appearance, attitude, demeanor, and capability. Dave Webb at Webb & Associates is the professional to assist in your real estate sale. Listen to 580 WIBW for upcoming Webb & Associates auctions, or go to the website D L Webb dot com. Webb and Associates sponsoring the Farm Profit Conference at Paola, March 22, D L Webb dot com.